Heed Audio Obelisk pre review | What Hi-Fi? 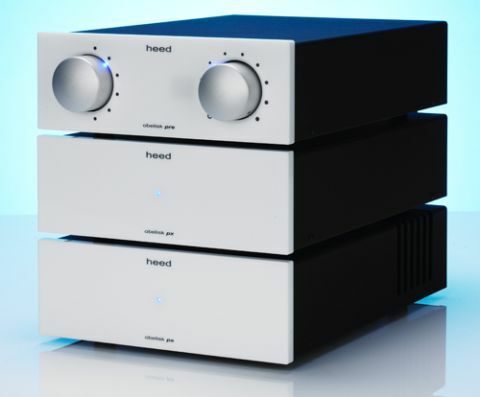 The preamplifier is a far more flexible device than its appealingly simple exterior suggests. It has plenty of line level inputs and has space on its circuit boards for optional add-on modules. At the moment these consist of a moving magnet phono stage (£145) and digital-to-analogue conversion module (£265). Our review sample came in basic form and wasn’t fitted with either of these, but experience with the DAC module in the Obelisk si integrated amplifier and suggests that it’s likely to be a good rather than great performer. The preamplifier comes with remote control, but it’s of the flimsy credit-card type that we normally find supplied with budget iPod docks. We think such a handset should have no place in a product of this price level. It’s the main point of contact the user has with the product and so should be given more priority. The preamplifier can be used as a stand-alone unit, or with an optional outboard power supply called the px, which costs an extra £880. We’ve chosen to go with the extra unit simply because the preamplifier sounds so much better when used this way. It looks like rather a lot of money when we take a look inside despite the obvious quality of some of the components used (see below). However, as with most of the better outboard power supplies we test, the sonic benefits are obvious. Without the px the preamplifier sounds tidy and precise. It’s still a musical performer and has an appealing surefooted way with rhythms and dynamic variations. Attach the power supply – just remove the shorting plug at the back of the preamp and replace with the supply’s lead – and everything gets better. The pre’s sound becomes larger and more expressive. There’s greater detail on offer and an improved handling of dynamic contrasts, both small and large. That said, the pre’s tonal balance remains unchanged. Take a look inside the Obelisk pre (below) and it’s easy to see the care taken over the circuit layouts, and the obvious quality of some of the components used. On the whole this preamp feels solid and able to withstand the rigours of regular use well. The great thing about this preamp when combined with the Heed Obelisk ps power amp and px power supply is that it concentrates the listener’s mind squarely on the music, delivering it with real enthusiasm.